NaBloPoMo – Day 24 – Happy Birthday, Madeline! 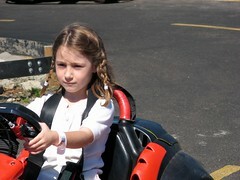 Today is my niece Madeline’s 13th birthday. Thirteen! A teenager!! Amazing! I hope you have a fabulous birthday, Madeline! Wish I were there to celebrate it with you! Can’t wait to see you at Christmas time! 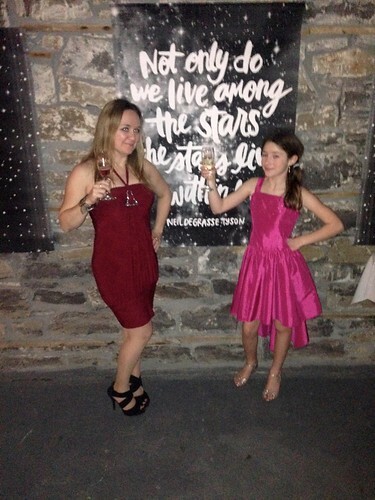 Happy 12th birthday to my fabulous niece, Madeline! A few more years and we’ll be cheers-ing your birthday with real champagne! It’s my sister’s birthday today and I want to wish her the happiest of days and many, many more! 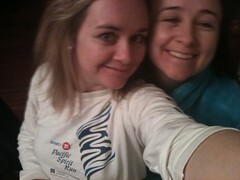 For those of you who don’t know my sister, she is a remarkable woman. A harder working person you will not find1. She’s brilliant, creative, endlessly energetic, and hilarious, not to mention kind, giving, and willing to do crazy things like, say, hang off the side of one of the world’s tallest buildings. Despite having way too many things on her plate2, she’s never to busy to help a sister out when she needs, say, a poster or a logo designed3, or you need advice on just about anything, because did I mention she is brilliant? 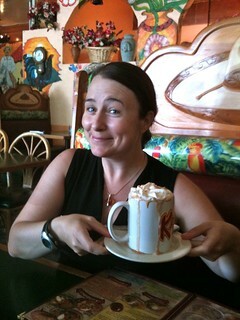 She came to visit me in June and, because I’m a delinquent, I appear not to have taken any photos, so instead I give you this photo from our trip to Portland a few years back, at our favourite Mexican restaurant with a delicious Mexican hot chocolate. Nancy, may your birthday be as delightful as a million Mexican hot chocolates and a million Voodoo Doughnuts! Love you! Happy birthday! I found this sign on Flickr, so I didn’t even have to make one. Because I’m just that efficient. Hooray for the Internet! Today is my sister’s birthday. And what can I say about my sister that I haven’t already said? If you’ve been a reader here for any length of time, you know that my sister is a made of kickass, wrapped in awesomeness, dipped in brilliance, and deep-fried in best-sister-ever-ness. My sister is my go-to person when I need advice, when I need to commiserate, and when I have an idea of utmost brilliance and/or hilarity to share. She talks me off the (metaphorical) ledge on which I often like to put myself1, she does all of the family responsibility stuff (since I’m not there to do it), and she can always make me laugh. My sister is always there for me and I’m so very lucky to have her. P.S. I know that this blog posting should really be enough, but don’t worry, I sent you a real gift in the snail mail. Image Credit: Posted by Sharyn Morrow on Flickr. A year ago, I wrote a birthday blog posting for my dad. When I wrote it, I had no idea that it would be the last birthday my dad would live to see. I had no idea that I’d only see him twice in person after writing that post1. I really did not expect to be reading that posting at his funeral just 8 months later. When I look back, I’m really, really happy that I wrote that posting when I did. My dad was really touched by it – he knew that I’d learned a lot from him and that I loved him. I’m sad that there’s so much he’s going to miss out on – and I miss him so much. But at least I know that he knew how much he meant to me – and I got to tell him that not just before he died, but when we all thought he’d be around for many, many years to come. 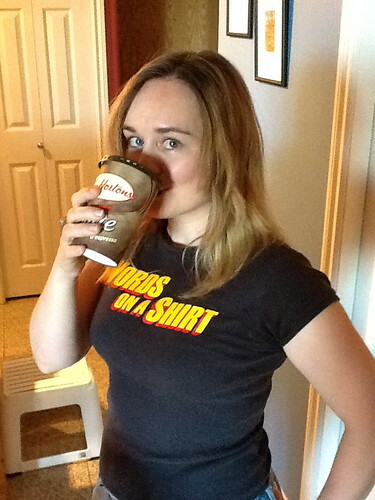 Today, I drank a Tim Horton’s coffee in my Dad’s honour. Here’s to you, Daddy. I love you. Happy 1st Birthday, Baby Thomas! Today, my adorable nephew turns 1! I’m back home. As I’m sure you can tell from the obituary I posted last week, my dad’s surgery did not go as planned. The first bad news we got was on the day of the surgery itself, when the surgeon came out of the operation and told us that the tumour that we had thought was benign was, in fact, melanoma – skin cancer that had spread to his brain. He was able to remove about 95-98% of of the tumour, but in the process had lost one of the arteries (the right cerebral artery1) leading to my dad’s brain, as the tumour was all wrapped up in that artery, which was feeding the massive tumour and my dad’s brain. The reason that he couldn’t take out the other 2-5% of the tumour was because it was touching the left cerebral artery and he couldn’t risk it getting damaged, because you only have four arteries feeding your brain, and so it was crucial to keep that left one functioning, or else all there would be no blood going to the front of my dad’s brain. The surgeon’s hope was that the left artery would be able to feed both sides of my dad’s brain in the absence of the right artery. We would need to get a consult with an oncologist to discuss chemo and/or radiation and we would need a full body CT scan to look for other tumours, as the melanoma may have spread elsewhere. After receiving this sobering news, we went up to the ICU to see my dad, he didn’t wake up. And he didn’t wake up the next day, or the day after that. There were lots of things that happened in these few days, which seemed like an eternity, but I don’t have the energy to type them all out. Suffice it to say that the surgeon came to us with the worst news on Friday, Feb 10 – it turned out that while we were hoping the left artery would feed both sides of my dad’s brains, it was, in fact, doing nothing. The right artery had apparently been feeding both sides of my dad’s brain and so, since that artery tore in the operating room on Wednesday, my dad’s brain hadn’t been getting enough blood to function. On Thursday night when they did a CT scan, they saw massive strokes all over his brain from insufficient blood flow. “He’s in a deep coma and there is zero chance that he will ever wake up,” is what the surgeon told us. Only the ventilator was keeping his body alive – and being kept alive by machines was something that my dad never, ever wanted to happen. We’d talked about it many times over the years and my dad was very clear that being kept alive on machines was, to him, not living. And I’m really glad that we’d had those discussions, because my mom, my sister, and I knew immediately that we had to take him off the ventilator. There was no second guessing, no feeling guilty that maybe we were doing the wrong thing – we knew undoubtedly that we were doing what my dad wanted. We called everyone in my family to give them an opportunity to come and say good-bye if they wished and that night, we took him off the ventilator and then we stayed with him, in shifts, for the next 14 hours. At 11:20 a.m., when he took his final breath and his heart stopped beating, he was surrounded by me, my sister, my mom, and my aunt (my dad’s youngest sister). It was important to us that he was not alone and that we were able to see that he passed peacefully. We are incredibly sad, of course, because my dad was a good man who didn’t deserve his life to be cut so short and because we miss him and we mourn all the things that he will miss out on – and that we will miss out on him being here for – as we go on with our lives, but we take comfort in knowing that he didn’t suffer. The last conscious thoughts he had were when he walked into the operating room, they gave him the anesthetic and told him to count backwards from 10. He spent his last three weeks – though scared at the prospect of a dangerous surgery and unhappy that he couldn’t drive or do all the things he wanted to do – talking to and receiving support from his family and friends. He knew that he was loved. We had a funeral for him this past Thursday and the funeral home was packed. We are not a religious family, so we did a family-run service at the funeral home, with speeches by each of his siblings, my sister, myself, and my niece. My seven-year-old niece, who was so close to her Grandpa, decided she wanted to give a speech about all the things she’ll miss about him – it was beautiful and heartbreaking. Truly, all of the speeches were beautiful – there were stories about my Dad that I’d heard many times before and other stories that were new to me. There was much talk, both in the speeches and when talking to people before and after the service, about how my Dad loved to help people – in fact, pretty much every person I’ve talked to who knew my Dad had a story about how he helped them. There was also a lot of mention from his friends about what a proud family man my Dad was, about how he was always telling anyone who would listen about his daughters and his grandkids. I really miss my Dad. My sister called me last night to tell me that something was wrong with my dad. She got him to go to the hospital – no small feat, as my dad is not a big fan of going to see doctors1 – and we were worried he may have had a stroke, but after much waiting around at the ER, when he finally got admitted and had a CT scan done, we found out that he has a brain tumour. Today he was transferred to a bigger hospital and is waiting to get an MRI and see a neurosurgeon in the morning. We really don’t know anything more than that at this point and I’m trying to remain optimistic that it will be operable. I’m waiting to find out what the prognosis and plan is to decide when I should go there. If he goes into surgery right away, I’m getting on a plane immediately. If it’s not that simple, I’ll figure out when is best for me to go there. I really wish it was tomorrow morning already, because the waiting is killing me. It’s hard to be so far away, because I can’t be there with my family for this. It’s hard even writing this posting, because all I can think is that my Dad isn’t at home to say to my Mom, “Hey Ann, come see what Bethy wrote on her blog today.” So I’m doing the only thing I can think to do right now – I’m adding Toronto Maple Leafs players to my hockey pool team. I just need my Dad to be OK. I love you, Dad. Today is my sister’s birthday. Like my dad, my big sister has taught me a thing or two over the years. 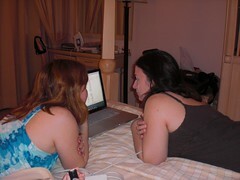 My sister explaining her stock market investment strategies to me while we were on vacation in the Dominican. And, yes, there is a spreadsheet involved. Nancy and her USA PAN!!!! I am a foodie and so is my sister. 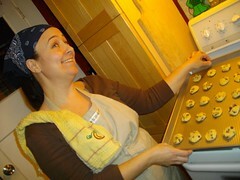 Whenever I visit her, I always learn new nifty kitchen tricks. Like how making your own homemade vanilla extract is super easy and super awesome. Or how freshly grated nutmeg is one billion times better than the pre-ground stuff and keeping a nutmeg nut and a little grater on your stove means you will put it in everything you cook and everything you cook will thus be 100% more delicious. Or that kitchen shears are the greatest, most awesome, most versatile tool one can have while cooking. And woe betide anyone who takes the kitchen shears and uses them outside of the kitchen! In addition to “Numbers don’t lie,” one of my sister’s other favourite sayings is “Good for you. You get a gold star.” These words of wisdom are spoken when one is complaining about some injustice done to you, or some instance where you know you are right and another party is refusing to acknowledge that. Her point is that it doesn’t matter if other people know you are right and complaining about things won’t make them better. If you just want someone to say that you are right, she’s happy to give you a gold star just like you got in elementary school – but does that really make it better? No, it doesn’t. Either do something about it (if it’s something about which you can do something) or don’t worry about it (because it doesn’t really matter is someone else knows you are right). We only get one shot at life, so we better make the ride worthwhile. “This is the show!” my sister will say. So don’t sit around waiting for things to happen. Don’t put things off because there might not be a “better” time to do them. Hell, there might not be *any* time to do them – we don’t know what tomorrow holds. This is the show, it’s not the dress rehearsal. Life is worth living, so get out and live it. My sister is something of a superwoman. She has a very busy career as a graphic designer, teaches several demanding university courses (in addition to the aforementioned full-time career job), and is raising two young (and freaking amazing) kids! She has also taken on the lion’s share of the daughter-ly, niece-ly, and granddaughter-ly responsibilities for our family, since I up and moved across the country and am effectively useless when it comes to such tasks1. 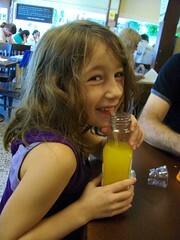 And amidst all this, she has lots and lots of fun. And since This Is The Show, isn’t that what life’s all about? My sister and I grew up thinking we were very, very different, only to discover in adulthood that we are very, very similar. I look forward to many more years of visiting and traveling together and Christmas baking (in person and virtually) and trading lecture notes and Gmail chats. I’m so lucky to have won the sister lottery in getting to have you as my big sister! 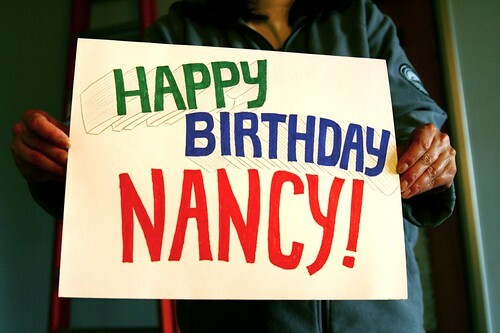 I love you, Nancy. 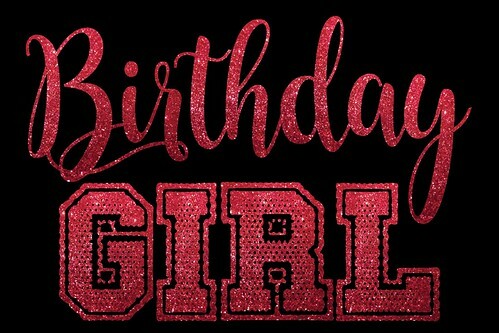 I hope you have a very happy birthday!